We are excited to work with your consumer insights team— or become your research department. National brands call us to gain insights on their consumer products and services because we provide them with truly personalized service. 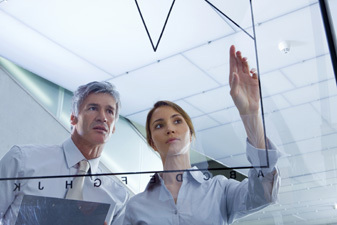 Our customized research plans provide value that reaches far beyond any budget. We were drawn to the research profession because we’re the kind of people who simply aren’t satisfied until we dig deeper. We don’t just answer your questions, we also explore issues that you may not have yet considered but that have a direct bearing on your success. Before starting our firm, Joe Harman and Sherri Atchison worked a lot of years in research. They saw that clients need flexible partners who can react quickly. Hearing people like you talk about the challenges you face left our founders wanting to provide better service tailored to your comprehensive needs and wants. So in 1999, they did something about it. Harman Atchison Research was founded with the goal of creating a dynamic, responsive company with a group of dedicated researchers. And, today, we provide all the resources necessary to accomplish medium or large research projects in a fast-paced environment. Our business model enables senior staff to be involved in every project; each of us has our own strengths and areas of expertise. We strive to be much more than another vendor. We strive to be your partner and problem solver. We ask questions that matter. We deliver actionable insights that make a real difference. While we take our research seriously in the extreme, we don’t take ourselves that way. So, don’t be surprised if you actually enjoy working with us. It’s all by design. Joe has over thirty years of experience in marketing research. His depth and breadth spans categories including restaurants, food, packaged goods manufacturers, apparel, and service companies. Joe specializes in quantitative studies involving new product development, product testing, strategic guidance and brand positioning. Sherri has been providing insights to her clients for more than two decades. She began her career as a food technologist, specializing in Sensory Science. During her marketing research career, she has designed and managed projects covering an array of categories and has in-depth quantitative experience in packaged goods and restaurant research. Sherri specializes in new product development, test-market evaluation and product optimization research. Seth also has over twenty years of marketing research experience. He has conducted research projects for a wide variety of client categories and has in-depth experience in telecommunications, IT, restaurant, and financial services industries. Seth specializes in new product development, customer satisfaction/loyalty analysis, brand equity/market analysis, and pricing research. He also has extensive experience with conjoint methodologies and applications. Each of our Research Analysts has successfully completed the industry standard University of Georgia Certificate of Market Research. The certificate is based on the Marketing Research Core Body of Knowledge and endorsed by major market research industry associations (such as MRII, MRS, ESOMAR, AMA). By completing this certificate, our analysts and associates have mastered a comprehensive set of applied learning objectives that encompass the foundation of the quantitative and qualitative market research process. With that foundation and hands-on experience with our senior partners, they are becoming the next generation of talented and discerning researchers.